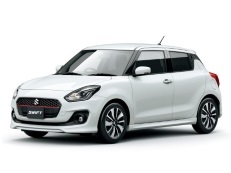 Correct Wheel Sizes, PCD, Offset, Rims and Tire specs for Suzuki Swift series. I wanted to know if 2009 alloy wheel 4 stud Suzuki swift would fit on my 2007 swift? Yes no doubt of it. On a 2008 Suzuki Swift 1.3 what would be the width of tyres i.e. on a 16" wheel - what is the widest width of wheel without the wheels rubbing?? please help!! Thank you so much for replying - so my son has bought 16" x 8.25" - will these not fit then?? Sooo stressful so thanks for a quick reply! Hi,Dorinda,16*8.25''is also ok.but you need to a wider size tire,I recommand you to go to a car shop and ask them to recommand you a tire. Hi,dorinda,Don't worry about the wheel arch.Only if the wheel diameter is ok,the width is not a problem.As,If the wider of the wheel increased,the high of the tire will be decrease.And finally,the whole high will keep in a safe zone. You're brilliant thank you - one last question and i'll leave you alone!! What about the tracking - will 8.25" effect the tracking of the car? Hi, Dorinda,No,It does not effect the tracking,Increase rims' width just effect the driving steady feeling and Steering.The widder the rims,the steady the car.And the widder the rims,the slowly steer for the car. Hi,Lynset,yes,it can fit for your car. Hi,salman,It will not harm your suspention.1 more inch widder is accessible.So,don't worry. I have 16 alloys on my suzuki liana hatch and low prof tyres 205/45/16 it is slightly different from factory recommendation would that be OK ? I have a suzuki swift, Japanese import, I'm trying to find wheel nuts for it but it's not the size specified, it's 12m but not 1-5 thread, I'm trying to find out what it is, aney suggestions? Hi,Jonathan,According to my data,it is 12*1.25.You can ask your local car dealer to try it. What other make cars have the same pcd and size wheel as the swift? Hi,Kev,The swift have two pcd editions,The one is 4*100, and the other is 5*114.3,Which one you have? Hi,Kev,If 4*100,You can use Opel Meriva 1.8i 2013 instead. I have a 2008 suzuki swift 5 door 1.5 glx I'm a little confused at the tyre size on it at the minute are 17s but everywhere I've looked it should be 14s can anyone tell me exactly what size etc tyres I need to be looking for I'm taking the whole alloy off and hoping to get new 1s would 205 with tyres 50 profile 17 et 40 be OK or not? 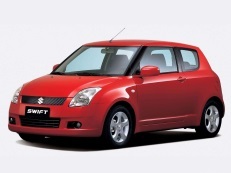 Would suzuki Swift 2009 sports wheels fit on swift 2006 model? Hi,Xin Qian,Yes,it can fit for. 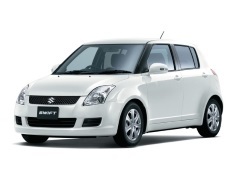 what are the biggest wheels (rims) that could fit on suzuki swift 1.3 glx 2000 ? Hi,Stas,The biggest wheel size for the car is 16''. Not sure what et49 56.6 means but wondering if the wheels would fit a 2007 swift ? Hi,Ash,The et49 means the offset of that wheels are 49mm and 56.6 means the center bore size is 56.6mm.They are the wheel specification.And for 2007 swift,These data wheel can fit for this car. Great, thanks for the info and confirming they will fit. Hi,B smith,sorry for the mistakes.And if m12*1.25 is fitable.Please also show us,We will update the data. What is the size of winter tires needed for a 2008 Swift hatchback? is there a range? Hi,Kim,You can use tire calculator to confirm a compatible.Or you can show your current tire size,Then i can help you confirm it. 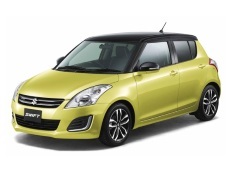 Will et30 CB:67 15" alloy suits the 2014 swift ? and what should be the tyre size for this rim ? Hi,Pradeep,No,swift wheel offset is 40mm,so your wheel offset is not compatible. Hi, i have a suzuki swift 1.3 GL from 1987. I want to change the rims but i don't find any rim for my car. At the moment i have the original rims 12" and i want to put 13" or maybe 14". Hi,Giovanni,Can you show your current wheel size,like bolt pattern and offset?I can help you find some 13'' or 14'' wheels that can fit for your car. Hi,George Barnes,The wheel size is 14*4.5J,et is 45mm,pcd is 4*100.Tire size is 165/70/14. Hi,neville,Yes,You can use tire calculator in this website to check tire compatible. are you able to tell me if the standard 15" mags from a 2008 Swift will fit in the spare tyre hole. My daughter lives in another town and only has a space saver spare. Hi, I have Suzuki Swift 2006 1.3 DDIS 69hp (EUDM). Мy question is what are the original wheels and tires for it? 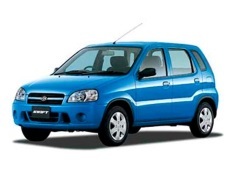 What is the biggest rim and wheel shize for 2009 swift? hi sir I'm in deeply in need for help for my india Suzuki swift 2018,im planning of a 16inch rims 100*4 and width 7" to change my stock 185/65/15 wheels,and I cnt find which model of the stud if its 1.25 or 1.5...and one last thing,i cnt find a proper wheel profile,but I do not whant to put a low profile due it will make my car lower than the stock.